Rome monuments are known throughout the world by all and visited by many every single day. 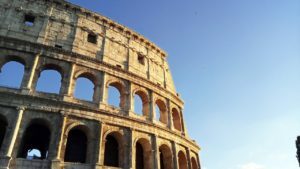 I would even be so bold as to say that at least one rome monument is definitely on most people’s “bucket lists.” There are plenty of monuments in Rome to choose from and if you give yourself enough time you just might be able to see them all (it’ll be worth it). 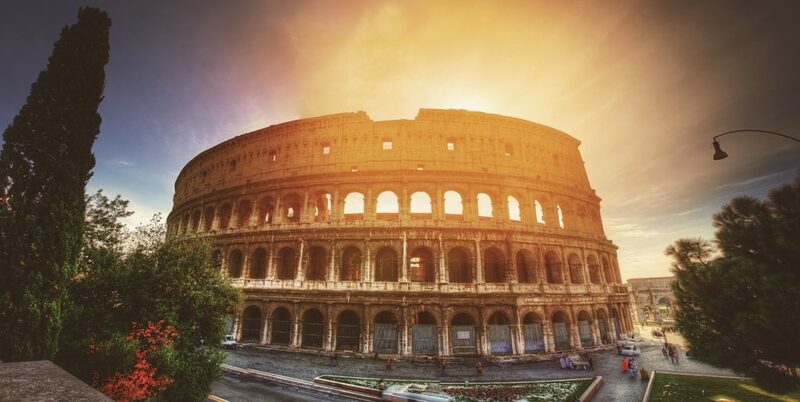 Below we have listed the famous monuments in Rome, Italy to browse. Remember, most of the monuments and sites do not require an entrance ticket, however, they get crowded, so to get the best version of these monuments, it’s best to go early in the morning or late at night. 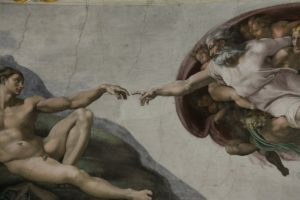 The Sistine Chapel – The chapel of the Apostolic Palace that was restored from 1477 and 1480 and renamed after the Pope Sixtus IV della Rovere. Most famous for “The Last Judgement” created by Michelangelo, among the other 9 main panels displaying the Stories of Genesis. Colosseum – The largest amphitheater ever constructed during the years 72AD-80AD; used for gladiatorial contests and other public spectacles. Partially ruined by an earthquake, this still remains one of the focal points of Rome and is one of the most popular tourist destinations. 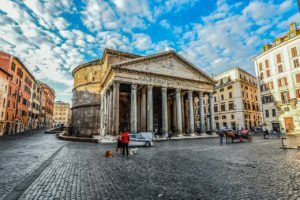 Pantheon – “Of, relating to, or common among all the gods” A temple to the Gods of Ancient Rome. Currently a Roman Catholic Church that still remains the world’s largest unreinforced dome made of concrete and one of the best preserved buildings in Rome. Burial site of painter Raphael and architect, Peruzzi, among others. 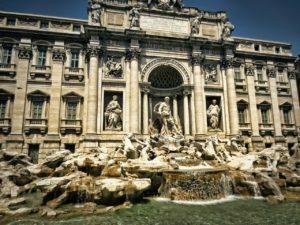 Trevi Fountain – One of the most famous fountains in the world at the center point of three roads (Tre vie) in Rome. Built at the end of an aqueduct, this fountain is one of the oldest water sources in the city. So, go throw a coin into the fountain; it’s for charity! 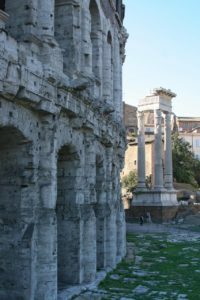 Theatre of Marcellus – ancient open air theatre showing nights of drama and song, that was started by Caesar and completed in 13BC by Augustus whom dedicated it to his nephew Marcus Claudius Marcellus. At the time it was the largest theater in Rome and used for more than 400 years. 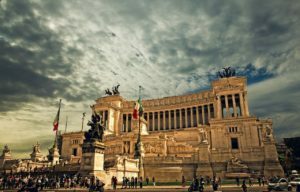 The Victorian – or Altare della Patria – erected on Capitoline Hill as a symbol of the city’s greatness. Built to commemorate the unification of Italy as one nation. Walk up (do not sit on!) the 196 steps to reach the Tomb of the Unknown Soldier. Trajan’s Column – A Roman triumphal column commemorating emperor Trajan’s victory in the Dacian wars that was completed in AD 113. 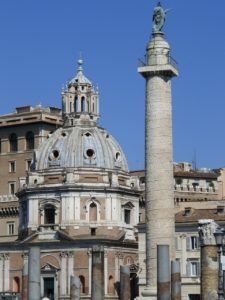 Located to the left of The Victorian (see above) you will encounter this 98 ft. tall column that is part of Trajan’s Forum that displays the war between the Romans and the Dacians spiraling up to the top. 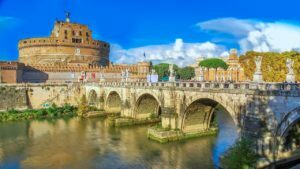 Castel Sant’Angelo – built originally as a mausoleum but instead used as a fortress and castle by popes. Pope Nicholas the III connected this fortress to the St. Peters Basilica in order to have easy access. Visit inside to view the many rooms, beautiful frescoes and even a torture chamber. Arco di Costantino – largest triumphal arch commemorating Constantine I’s victory over Maxentius at the battle of Milvian Bridge that can be found right next to the Colosseum. 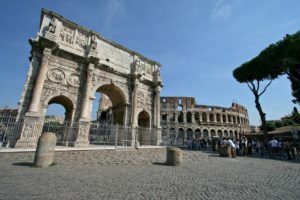 Built in 315 AD, is the largest of the 3 triumphal arches that exist in Rome today. 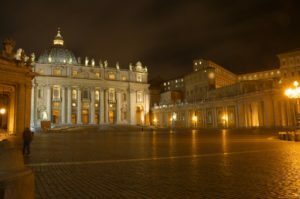 Basilica di San Pietro – Italian Renaissance church in Vatican City and the papal enclave. The second largest church in the world and runs the length of two American football fields!! Inside you will find Michelangelo’s famous sculpture “La Pietà.” You can also climb to the top of the dome if you are willing to do 491 steps! 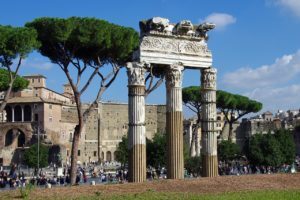 Imperial Forums – monumental public squares built over a period of 1.5 centuries that were the center of the Roman Empire and the Roman Republic. Right near the Roman Forums, these were the center of Roman politics, economics and religion. 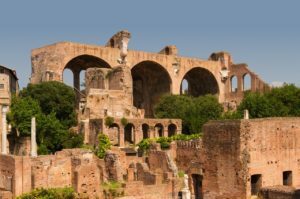 Basilica di Massenzio – Constructed in the early 4th century AD, was the largest building of the Roman forum. Most likely used for a number of things such as council chamber, a court house and a meeting hall. Later revealed through examination, the architecture of this Basilica was influential and featured many new aspects for the time. Piazza Navona – Built on the site of the Stadium of Domitian where Romans would come to watch games and competitions. 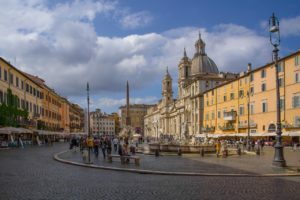 Equipped with three fountains and a church, it is thought to be one of Rome’s most beautiful piazzas and has even been featured in a number of movies. 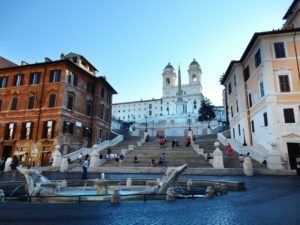 Piazza di Spagna – One of the most famous piazzas in Rome located at the bottom of the Spanish Steps (135 to be exact)! In the middle of the piazza you will find the “Fountain of the Ugly Boat.” Given its name because the Spanish Embassy used to be just nearby. Basilica di Porta Maggiore – This underground basilica, that was discovered by chance, was just recently opened to the public in very small and limited times. The restoration work is still taking place currently. It has a complex structure and is absolutely impressive in the architectural world. Temple of Bramante – considered among the first great buildings of the high renaissance and was completed in 1508. Located in the courtyard of the Church of St. Peter in Montorio, you will find this tiny temple created by the architect Bramante. Mausoleum of Augustus – was completed in 28 BCE and at the time, was the biggest tomb in Rome. Contains the remains go Augustus, his sons and other roman emperors. Ara Pacis – The Altar of the Augustan Peace of Rome and considered a masterpiece of sculpture. Commissioned by Emperor Augustus to commemorate his victories of Gaul and Hispanic (France and Spain).